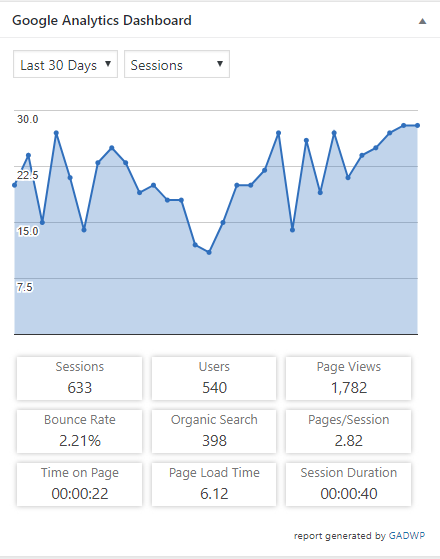 Do you have Google Analytics installed on your website? This is one of the most important tools you can use for successfully managing your online presence. Being online and being present takes a lot of work and a lot of effort! Wouldn’t you like to make the most of all that work? Google Analytics can help you do just that, but in order to help you, it needs to be set up. If you don’t know how to do that, I strongly suggest hiring someone who understands how it works and can set it up properly to best serve you. Own your Analytics – Your Google Analytics account should be set up under your company’s Google account. Sometimes the web developer or SEO manager will have the analytics account set up under their Google account. If that is the case, the account should be moved so that it is in your company’s account and you can make the web developer or SEO manager a manager of your Google Analytics account. This way they can still have access to the information they need, but the account is under your control. Here is some information from Google about setting permissions. Use Google Analytics – Don’t just install it and check in every once in a while to see how many people visited your site. Actually use it! There are seemingly endless ways to use Google Analytics to help you grow your business. Even the most basic uses, like seeing where people land when they get to your site, where they are coming from, and how long they spend on each page, can give you enough information to make productive choices in your online marketing efforts. When you start to use more advanced features, like setting goals, your business can really take off! Hire someone who knows Google Analytics – We all have our strengths in running our businesses, and your time should be spent doing the things that only you can do. Google Analytics is a very complex tool that, as I stated above, when used properly, can help you to grow your business, making the ROI a no-brainer. Make Changes – With all the information you will be getting from Google Analytics, do something useful with it. Are people staying on a particular page or blog post for a while (meaning they are actually reading it!) and then leaving? Maybe this is because you haven’t given them something else to do. This information gives you the starting point – now you have to make some changes. Do you have a call-to-action (CTA) on that page/post? This could be a free download that relates to the post they have just read (capture their email) or “get a free consultation” (link to phone or contact form). Are you getting more visitors from Twitter than Facebook? This information will allow you to look into this further and see if it’s because you are promoting more on Twitter (then start promoting more on Facebook) or if more of your ideal clients are on Twitter (keep up with what you are doing on Twitter and maybe ramp it up a bit). GA can give you tons of information, it’s your decision what to do with it! Would you like to learn more about what Google Analytics can do for you? Set up a free consultation over here. Hi Darleen. Thank you for your comment. The GADWP plugin should really walk you through the setup process.